Moscow has reacted angrily to a Georgian threat to open fire on ships which "illegally" enter the waters of its breakaway province of Abkhazia. Russia, which has close ties to the Black Sea province, said it would respond to any attack on its citizens with "the necessary rebuff". The waters have been out of Georgian control for more than a decade. Russians MPs visiting another breakaway province - South Ossetia - have accused Georgian forces of starting a gunfight. Moscow's relations with Georgia have cooled since the election of Mikhail Saakashvili as president in January. The new leader has called for the tiny Caucasian republic's rebel provinces to return to the fold and scored a major success in May when he bloodlessly restored control over another region, Ajaria. 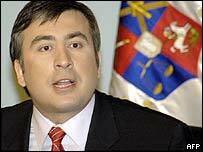 Mr Saakashvili announced on TV on Tuesday that his forces were ready to sink shipping off Abkhazia. "I earlier ordered... that we should immediately open fire on, and sink, every ship which enters Abkhazia," he said. Speaking just days after a Georgian patrol boat fired shots at a civilian vessel in the Black Sea, he added that Russian tourists should "pay attention" to his words. Abkhazia's Black Sea coast is a popular destination for Russian holidaymakers, who often arrive by boat from the nearby Russian resort of Sochi. Russia is the breakaway province's main economic partner and most Abkhaz residents have Russian citizenship, while Russian peacekeepers are deployed both there and in South Ossetia. The authorities in the province, which fought a bitter war to break free from Georgia after the collapse of the USSR, have described the Georgian threat as "state terrorism". In Moscow, the foreign ministry issued an unusually strong warning to the Georgian leadership. "Russian citizens have the right to choose where they want to go on holiday..." it said. 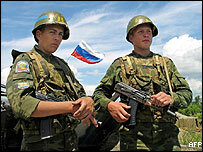 "Any attempts to injure or threaten the lives of Russian citizens will receive the necessary rebuff." None of the Russian MPs visiting South Ossetia was injured in the attack near the village of Salabuk, north of the provincial capital, Tskhinvali. However, the Russian group's leader, Andrei Kokoshin, said he believed the firing had been started by the Georgian side and that he would be making an official complaint. The Georgian president has accused Russia of fomenting trouble in South Ossetia in an effort to preserve its influence over Georgia. The authorities in the rebel province accuse Georgia, in turn, of raising tension by blocking a main road into the territory.